Local Family restaurant featuring an assortment of freshly breaded chicken nuggets. 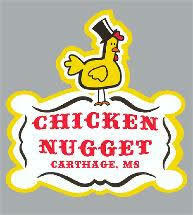 Don’t let the name fool you, they have a whole lot more that chicken nuggets. A daily fresh salad bar is a favorite of many of the local. They are known for their freshly breaded fried fish and shrimp. The hamburgers selection and dinner plate selection is also very inviting. We stopped at lunch, had no idea what kind of restaurant it was, but the parking lot was full, which is always a good sign. The place was busy, but serve was quick and the food was outstanding. You had everything from local construction workers, mothers with small children, professional in suits and even a couple EMS workers eating. Definitely a local favorite. Had the privilege talk with the owner and meet his daughter. (friendly people). Debbie had the chicken nuggets and the salad bar, I enjoyed a patty melt and fries. If you are ever in the area this is a must stop.